Want to liven up a party or big event? Or create a unique gift? Learn how to make a candle DIY paper lantern as well as a cool paper lantern chandelier. Paper lanterns are a popular decorating choice nowadays. They can be playful, elegant, or classic and are relatively low cost. They can transform a room or a party instantly and even the most inexperienced DIYer can create them in an hour or so. It’s an easy way to redecorate or accessorize on a budget. Paper lanterns originated in ancient China and were typically used as lamps. They quickly spread across Asia and are now commonly associated with festivities and holidays. Making paper lanterns can be as simple as a paper bag with a candle inside of it. More intricate designs are made from paper or silk, with frame from bamboo or wood and a lit candle or battery-operated lamp inside. We’re going to show you how to make a DIY paper lantern using both styles with a modern twist. Paper lanterns today come in a variety of shapes, sizes and designs. Traditionally they symbolized joy, celebration, good fortune, and longevity; now they scream good taste and style. Pro tip: Make sure you have extra paper on hand – mistakes will happen as you’re learning and you don’t want to run out halfway through a project! You might find that you already have all of the materials you need for these lantern making ideas on hand. That’s my favorite kind of DIY! If that’s not the case, it’s all things that will be fairly easy and low cost to get. Create your design and start cutting! First create your design or use the templates provided. Make sure to cut carefully on the items you wish to make dimensional, rather than cutting off too much and leaving an empty space where they were supposed to be. You’ll want to measure the glass you’re using next and cut the excess paper away. You can also cut and fold the paper to where it covers the bottom of your glass if you prefer. To make your design dimensional, fold the blossoms or the design of your choosing up so that it stands out from your paper. Finally use the double sided tape to tape the paper onto the outside of the glasses or adhere it to itself and create a sleeve to slip the glass into. Pro tip: Use different colored ink to designate which parts of the design need to be cut out completely and which are simply being cut around and folded for dimension. Slide your candles into the containers and light them up Your creations are ready to be enjoyed! Pro tip: Soy and Palm Wax candles burn longer and cleaner. You’ll be able to enjoy your designs longer and they won’t cause soot to build up on your holders. Thanks to blissful2015 for this great tutorial idea! Now that we’ve eased you into making paper lanterns with the candle holders, you’re ready to tackle a slightly more challenging design. We’re taking a store bought paper lantern and transforming it into a cool and funky paper lantern chandelier that is sure to liven up any party or room. You’ll want to scour the internet or your local stores for the tools and materials you’re going to need to complete this project. While it isn’t complicated for most DIYers, it will take some special materials and a bit of your time. Pro tip: Use colored paper or scrapbook paper to match your home décor if you’d rather not use a color changing bulb but still want variety . In order for your DIY paper lantern to look right and the design to line up – you need to square your computer paper off. You can measure to do this, but I think it’s easier to fold it on the diagonal and just cut the excess off. You’ll then fold and cut that square into four equal but smaller squares. Repeat that with the remaining 34 sheets of paper. If you ordered your materials online this should kill the time until the delivery truck shows up! Pro tip: If you have a paper cutter, this would be the time to use it. You’ll have straight cuts which are easier to fold and your pieces will be much more uniform. Alright – no washing but there’s plenty of folding. It’s time to start creating the textured design for the lampshade now. You’re going to take a square and fold it along both diagonals. Now fold all of the corners into the middle. Next, take the whole piece of paper and flip it over. Fold all the corners in towards the middle again. Pro tip: Don’t do this step if you have young children running around. Or cats. Your room will quickly resemble the aftermath of a ticker tape parade. Remember those paper fortune tellers from elementary school that predicted who you would marry, how many kids you’d have and what house you would live in? Well, we’re going to make 125 of those to glue to our paper lantern chandelier. For the next step you want to fold your paper horizontally. This should create four flaps that you can slide your fingers under and push them toward the center, as if you’re trying to touch them together. Now you have a paper fortune teller ready for the next step. Pro tip: If you’re still stumped on how to fold the paper properly, Wikipedia has your back. It’s time to start gluing the designs to the paper lantern now. Pro tip: If your hot glue gun has a range of temperatures, try using the medium setting. It will avoid burning your fingers as you work, or melting through the paper lantern as well. Heat your hot glue gun up and place a small dab of glue in the bottom center of your fortune teller and quickly attach it to the homemade paper lantern. You can start anywhere on the lantern and work your way around. Just fill in any open spaces at the end with a fortune teller cut to fit the space! Pro tip: Not sure which way is up or down when it comes to gluing your fortune tellers? The bottom is the section with flaps where you slip your fingers in to draw the pieces together. You’re ready to put your lamp together now that you’ve attached all 125 fortune tellers. We promise – you’re almost finished! If you’re mounting it to an existing lamp you’ll need to get creative and attach it any safe way you can devise. Picture hanging wire might be a good option! If you’re using it with the socket extender from the ceiling then a paperclip works really well to fasten it. You open the paper clip up along the center and hook both sides to the outer wire edge of the lantern.. Pro tip: If you have an existing lamp you’re using you might want to find paper Chinese lanterns that will fit its current shape and mounting brackets – they come in cylinders, globes and alternate shapes. 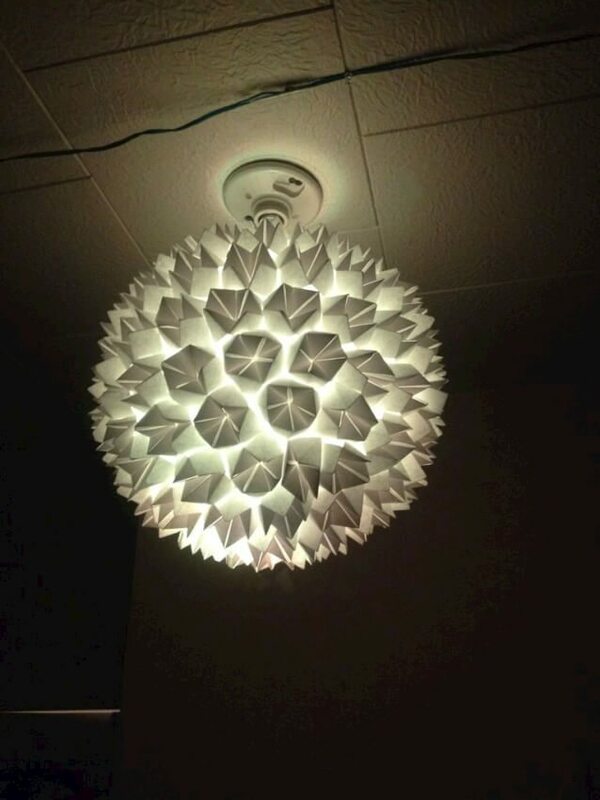 Mulrich125 deserves all the praise for this great DIY paper lantern making idea. Remember that you aren’t limited to the ideas we have here. Experiment with different types of paper, different folding techniques or alternate lighting options. The great thing about DIY projects is that they are just the starting point and you can adapt them to whatever you can dream up. These paper lanterns are some of our favorite DIY projects because they are relatively quick, simple, and low cost. The candle luminaries especially lend themselves well to gift giving while the hanging paper lanterns are a favorite of ours to customize based on the room or event. Imagine the fun that can be had transforming them into cartoon characters or dragons for a children’s party or matching school colors for proms and graduations. The possibilities really are endless. Let us know if these tutorials on how to make a DIY paper lantern helped you feel more comfortable with paper crafting or if they inspired you to try your first DIY. Do you have some tips or tricks to share with us now that you’ve given this project a go? 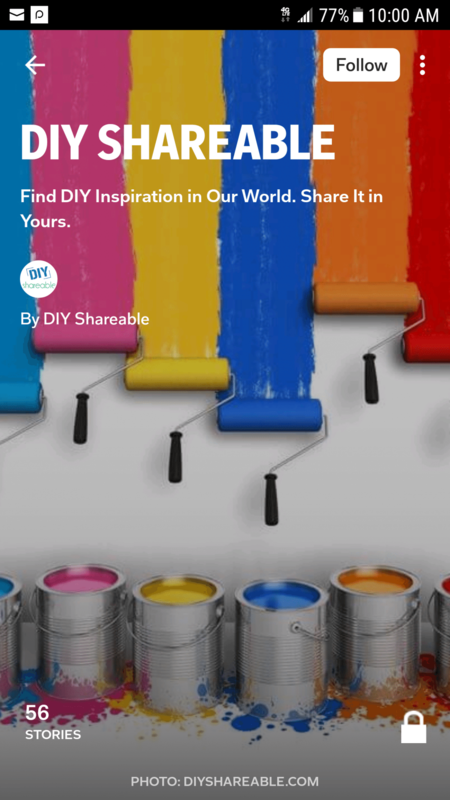 We want to hear about it and your suggestions for a future DIY Shareable! Tell us all what you think in the comments, and remember to share this with your friends!